In this article, the focus is on the importance of mobility and agility in and around the home. Pluss points out the little things that we might overlook that would otherwise cause problems for people with disabilities. Around the home, mobility and agility issues may translate into difficulty negotiating long, crooked, inclined, or uneven pathways, and walking up or down stairs. They may also mean trouble carrying items from one place to another and difficulty reaching into floor-level cabinets and high shelves. Users of wheelchairs and walkers may not be able to manoeuvre around in narrow doorways and corridors or thresholds. People with limited mobility and agility may have difficulty getting in and out of bed, on and off the toilet, and in and out of the tub or the shower. Further, they too may be at risk of a scalding at the sink or in the shower when the flush of a toilet draws off cold water, this is not because they cannot feel the hot water but because they cannot move quickly or without assistance. One concept of home modification to promote independent living for people with limited mobility and agility is to eliminate or reduce barriers to easy movement outside and inside the home. An automatic garage-door opener facilitates arrival and departure of household members by car or another kind of vehicle. For the user of a wheelchair or a walker, a ramp or a berm (an earthen substitute for a ramp, often more aesthetically pleasing) leading to the entrance to the home eliminates the need to climb or descend steps, as do curb cuts in pavements around the home. Alterations to doors and doorways are possible following the same principle. One possibility is to reframe doorways to increase the clearance to at least 36 inches so that users of wheelchairs and walkers can pass through unencumbered. When an additional one or two inches of space will provide the needed clearance, another possibility is to replace standard hinges with swing-clear hinges. When the swing of a door takes up the maneuvering space that wheelchair users need, an option is pocket doors, doors that slide back into a pocket created in the wall. Another modification to doorways is to replace their high thresholds with low, beveled ones or with flooring to create a smooth transition. Dangerous or awkward level changes are not limited to the threshold of doorways, of course; they may occur wherever one type of flooring meets another. A helpful alteration to doors is levered handles, which are easier for everyone to manipulate. Both add-on levers and replacement levers are available. A C- or D-shaped loop handle mounted on the pull side of a door, near the hinged edge, helps users of wheelchairs or walkers close doors after them. Around doorways and within rooms, users of wheelchairs and walkers need maneuvering space. Family and friends should give some thought to how these people might pass through a given door. This may simply involve moving some pieces of furniture that obstruct passages. Within rooms and halls, high-density, low-pile carpeting makes movement easier for these people by reducing effort and eliminating tripping hazards. Having a bathroom and a bedroom on the ground floor offers an alternative to negotiating stairs. This might involve converting a study to a bedroom, and a half bath to an accessible full bath. A more expensive approach is an addition to the house. 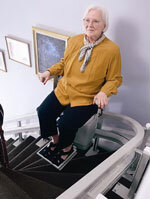 If these kinds of modifications are not possible, a chairlift or an elevator can be installed to transport the person from one level to another. Suggested modifications to eliminate barriers in bathrooms include installation of a roll-in or walk-in shower, with a seat, a flexible shower hose, and a hand-held shower head. For a household member with severe limitations, some alternatives for the bathtub are a water-operated hydraulic seat; a portable, hydraulic boom lift; and an overhead track lift. A lift is also useful in the bedroom. Indeed, professionals can craft a track for the lift, to move a person from the bedroom to the bathroom and back. A related approach in this realm is to enhance safety. For example, soft, nonskid surfaces on bathtub bottoms, shower floors, stair treads, and stair landings minimize the danger of slipping. Treads of a consistent depth, with closed risers of a consistent height, also lessen the hazards of ascending and descending stairs. Another strategy of home modification for people with limited mobility and agility is to create supports within the home that help with movement or allow resting. Among the most useful items in this category are grab bars and hand rails. Grab bars are particularly helpful in bathrooms as aids to getting in and out of the shower or the tub, and up from or down onto the toilet. Hand rails installed along hallways and on both sides of stairways can offer significant security to a person whose mobility and agility are limited. As with people whose strength and range of motion are limited, a useful approach is to bring items to people or to relocate appliances and products. In the kitchen and the bathroom, suggested modifications and products in this category are pop-up appliance holders, pull-out cutting boards and bowl holders, and cut-out, or recessed space beneath countertops, cooktops, and sinks to accommodate a seated person or a person in a wheelchair. Spacer rings and thick seats can raise the height of existing toilets. There are now new toilets with seats 19 inches above the floor. Whether the home requires simple modifications, or more complex ones, these alterations can allow individuals to remain in the home or families to remain together. If you are planning new construction, universal design elements can be used to make the home more accessible and friendly to all users. When this is not an option, modifications and assistive devices can bring independence and confidence to the homeowner and family members.